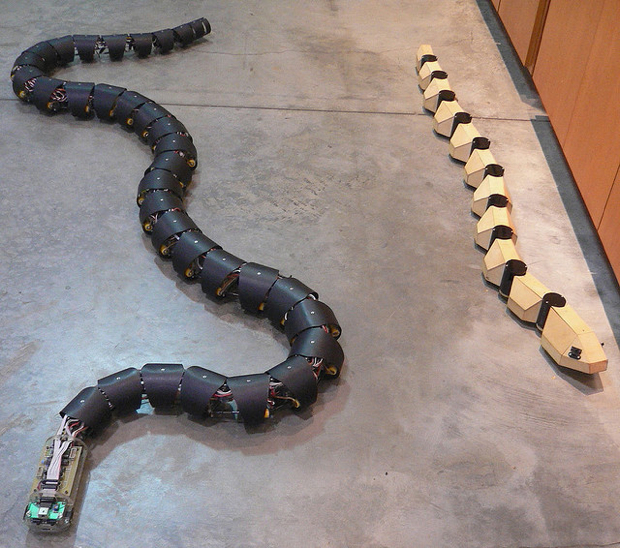 Robotic Snakes On a Plane With Aerial Drones? Yep, the next generation of mechanical heroes comes in all shapes and sizes. Robots of mostly academic interest may suddenly be getting a real-world baptism by fire, reports the Chronicle for Higher Education. Robots will likely take to the sky, sea, and ground in an effort to monitor the stability of structures and rescue those trapped. One such robot, from a researcher at Tohoku University in Sendai, can wriggle like a snake into the rubble of a collapsed building. Equipped with a camera, it could discover survivors and lead to rescue efforts. Another robot, a tank-like machine with treads, has sensors to detect chemical contamination. Aerial drones can provide a live feed enabling quick assessment of structural damage to buildings; while submarine robots will likely do the same for undersea infrastructure. The big frontier for disaster-enabled robots is search-and-rescue. The challenges are both technical and, largely, psychological. Not long ago, researchers at the Georgia Institute of Technology taught robots how to deceive. Though this sounds like a very bad idea indeed, Alan Wagner, one of the researchers, defended the idea to me based on a search-and-rescue scenario. “Imagine a situation in which they’re [i.e., the human victims] trapped,” he told me, “they’ve perhaps been under rubble for hours. They would feel very scared when a robot with claws and a flashlight and different sensors approaches them. A lot of times they’re in a position of almost submission if they’re lying down or crushed under something. So it might be necessary for the robot to act in a manner, to deceive them about its capabilities in order to save them.” In a purely theoretical instance, if a trapped person inquired about whether the robot had the physical strength to hurt it, that might be an occasion for a little robotic white lie–if it could save the person’s life. A robotic in-rescue entertainment system, then: extremely bizarre at first blush, but when you think about it, that makes a lot of sense.